By far and away my favourite food to eat, for lunch at least, is hummus. It is such a versatile food which can be used both as a filling or as a dip, and flavoured with no end of different spices and herbs. 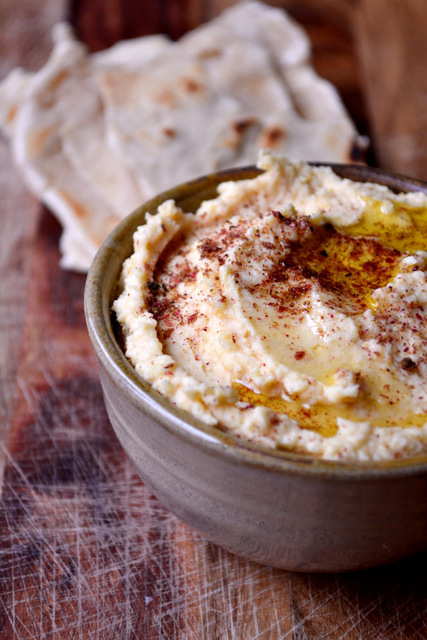 This hummus recipe may contain rather a lot of olive oil, but it’s still a great healthy snack and a fantastic way of taking on protein. 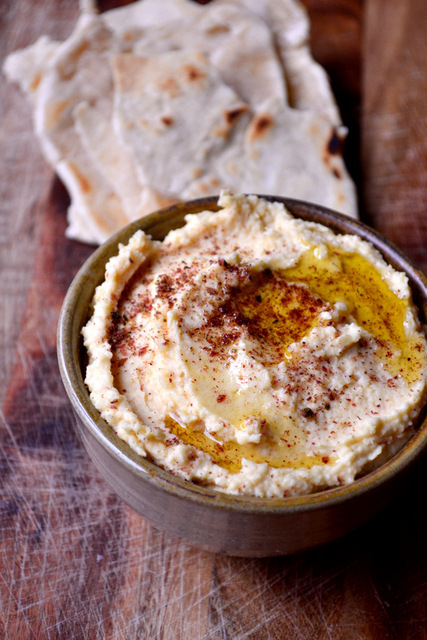 A food processor is required to easily make hummus, but beyond that it is ridiculously simple and worth-while making. This particular batch of chickpea goodness will be flavoured with cumin, chilli and a small amount of coriander. However, you can include whatever ingredients you like, or, indeed, none at all. In addition to this, one can make a large batch of hummus in around 5 minutes, this will last in the fridge for 3-5 days. Simply blend together all of the ingredients, taking care not to utterly destroy the texture of the chickpeas. One may add a little more oil if the hummus is not quite the right texture. Cost: This large bowl of hummus which is probably enough to feed 3-4 people will cost around £1.30 to make. This can be drastically reduced if you make “plain ol’ hummus” and remove the optional extras. I LOVE HUMMUS!!! 😀 I just made some this afternoon!!! 😀 YUM! Thank-you very much! Yours looks rather enticing too! Great post. I can’t understand why people buy hummus when it’s so cheap to make and tastes better homemade. I’m afraid I’m usually forced to due to my lack of blender when I go back to university. But if you have one, then it’s stupid to buy it pre-made. I make a lot of houmous myself. I use a “stick blender” to get the job done. It’s small, inexpensive, easy to clean up. Give it a look at Amazon. Search for “stick blender”. Ah, a good idea, I may invest. Thanks. I have to say it’s a long time since I made houmous. I think it is even better if you soak and cook your own chickpeas.. Still it yours looks nice and fresh. I’ve got everything on hand except for a lemon… guess my lonely lime in the bottom of my fridge’s produce drawer will have to do! Thanks for this! I’m sure it’ll do an admirable job, it’s really just to cut through the other flavours. Chickpeas and other beans are brilliant for the health of your bowel and colon. Flatulence when eating high-fibre foods can be a sign that you’re low on enzymes in your gut. 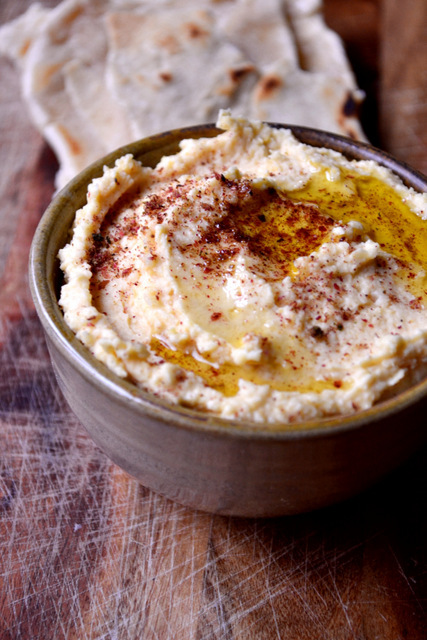 Eating hummus with raw vegetables will help (because the enzymes in raw vegetables have not been denatured by cooking), especially if you dress them with cider vinegar or lemon juice. Haha, Alice! I do like to learn something every day, particularly when it has something to do with flatulence! Haha – I was only tiny then! Thanks for this post! Here in the US, we add tahini- a sesame seed paste. I currently can’t eat anything with sesame in it, and was missing hummus. Now I don’t have to!!!! We usually do here too, but I don’t find that it’s necessary.